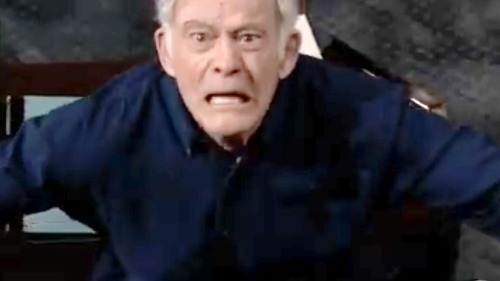 General Hospital spoilers tease that Sonny’s (Maurice Benard) situation with Mike (Max Gail) is going to get increasingly difficult as GH fans can see in the weekly promo below. Sadly, Mike has Alzheimer’s and while he is still functioning well much of the time, he does have his difficult moments. He’s sometimes confused and agitated, as Alzheimer’s patients often are, and there are instances in which he needs skilled but delicate treatment. Sonny has Felix (Marc Samuel) to tend to Mike around the house, and the two of them get along well, but everyone in the Corinthos household knows a truth that’s nearly unbearable for them to think about…that there will soon come a day when Mike will need to move to an assisted living facility and get more round-the-clock care. The idea of Mike in one of these facilities is horrifying to Sonny. He knows that Mike would get good and much-needed care, but it would break his heart to send his father away. To Sonny, sending his father off to a care facility would be tantamount to getting rid of a problem, and Sonny does not want to send the message to Mike that he’s a problem or a burden in any way. But as Mike’s Alzheimer’s progresses, he’s bound to have more difficulties that will probably force Sonny to face the reality that an assisted living facility is in Mike’s best interests. Mike’s already had several spells of agitation, and recently he fell and required stitches in his head. Unfortunately, it may take a more serious incident for Sonny to realize that he needs to act on his dad’s behalf sooner rather than later. Carly (Laura Wright) has weighed in on the matter with Sonny, and so has Felix and Stella (Vernee Watson), each of whom has urged Sonny to talk to his dad and involve him in the decision-making. The best case scenario would be for Sonny and Mike together to decide when in the future Mike should enter a facility and which facility to enter. But it really all comes down to Sonny making the very difficult decision to broach the topic with Mike and face Mike’s inevitable initial opposition to the idea. It will likely be a heartbreaking conversation, and one that takes real authenticity and openness. For Sonny, who is typically very guarded, the idea of such a conversation probably scares him. But it’s one he needs to have. Sonny may be inching closer to having this conversation with Mike. Sonny’s seen occasionally glancing through the Alzheimer’s facility brochures, so he may be gradually warming up to the idea. General Hospital spoilers say that Sonny will confide in Felix this week, so perhaps Felix will offer some suggestions and moral support. Do you think that Sonny will come around to the idea of a facility for Mike while Mike is still able to help make the decision to go? Stay tuned to the ABC soap and don’t forget to check CDL often for the latest General Hospital spoilers, updates, and news.